These ten steps won’t necessarily guarantee that instant ‘wow’ factor, but they will offer some measure of lushness; no matter if your end goal is 10 days, 10 weeks, 10 months or even 10 years away. Don't despair if you can only spend 10 minutes, or 10 hours...just start and work on the rest as you can. It’s been said that our gardens, like our attitudes, are what we make of them.. I agree. I always want a perfect garden and I want it to be perfect right now. But that elusive character trait, patience, is often just beyond my grasp. Without an unlimited budget, planting a few flowers wasn't enough to make a garden. So I needed to find other ways to make a beautiful garden while I waited. 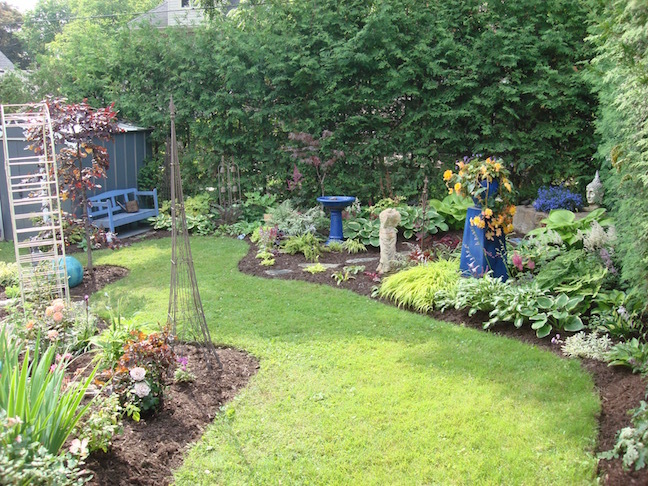 A young, or new garden, planted mostly with perennials, will likely keep us waiting a couple of years before giving that ‘wow’ factor. But if you're like me, in the meantime, I still want it to look ‘lush’. I have found that while I wait, there are some things I can do to help it along. Perhaps she meant that no matter what we do, we should do it with all our heart and in the end, our garden will please not only our eye, but those who come to visit. Here are some things that have worked for me. Make a list: a few inherited perennials, shrubs, trees; a nice view, good -or not so good soil -too many weeds or unknown plants; an overgrown garden or no garden… a few colourful pots, a good garden shed or even one that is falling down….list them all. Take photos to see objectively how your garden looks now. A photo will show you what your brain does not want to see, or your eyes miss when you look around. Where is the sun? part sun? part shade or full shade? Where does your eye go first when you enter the space? All of these contribute to the foundation or the bones; the starting point of your garden. How much are you willing to spend to get what you want? What is pressing? privacy? a place to sit? a place for the kids or pups to play? 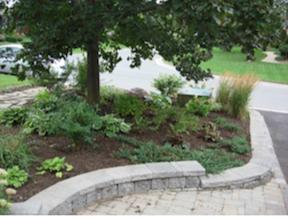 New flower beds with sensuous curves, or do you prefer straighter formal lines? Do you want more or less grass, another tree, a new path; more flowers, and/or vegetables. Consider all four seasons and what you can do now if it is gardening season. You may need a different sketch for each season to add to your plan. Begin where you will see the most difference right away. And, after weeding..... no gardening, no new plants, just weeding. Remove sticks, dead plants, and especially weeds. Or place a few pots full of colour here and there. Nutrients come from air, light and soil. 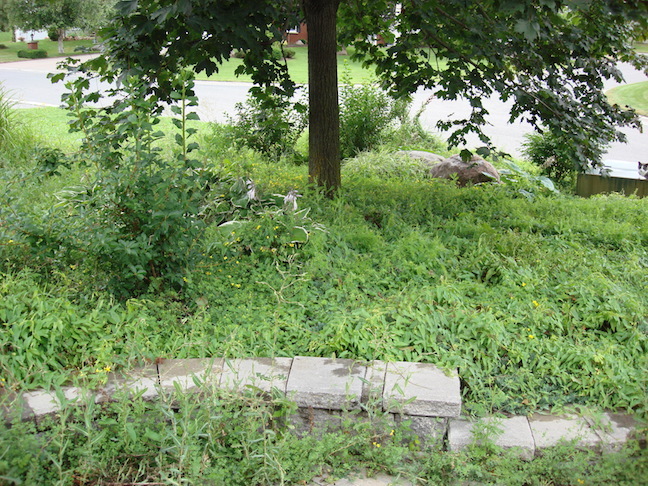 If the garden is overgrown, the weeds will take the nutrients and block essential light. Keep weeds from spreading by spending 10 minutes a day for a very large garden or 10 minutes a week for a small garden. *If you don't have a composter, plan your work so the green waste will be picked up close to the days you weed. 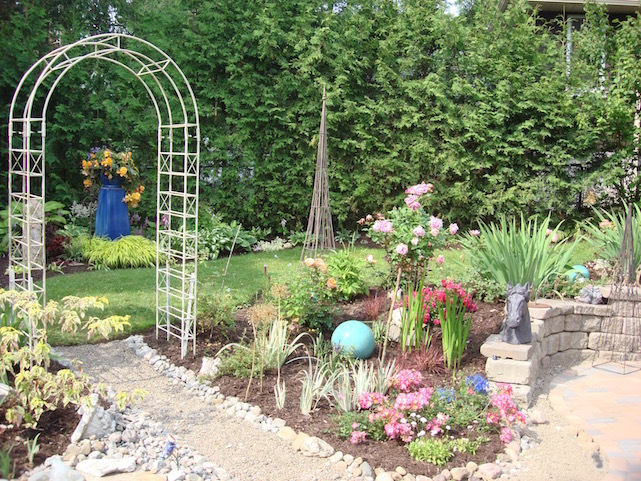 it makes your garden look intentional and gives definition to the lines of the beds. Edge along the grass, or edge with stone or brick... but do edge. Always add Compost: poor soil will never make either a beautiful garden or a productive one. If you cannot afford a soil test, you will never go wrong with adding compost. Rich soil will help the little root ends to find and retain the nutrients they need to thrive. ..and Mulch with shredded bark like Hemlock, which decomposes, adding nutrients while keeping soil moist, neat and mostly weed-free. Weeds coming through are easy to pull. Cuts down on watering. 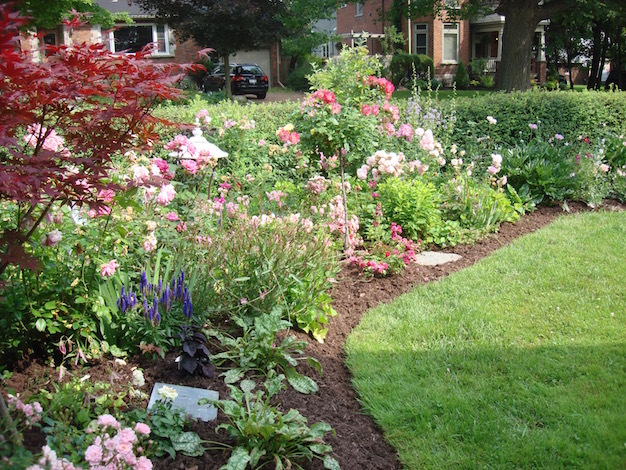 *Always ask what your mulch is made of and what is added to coloured mulch: the dyes may affect some plants. 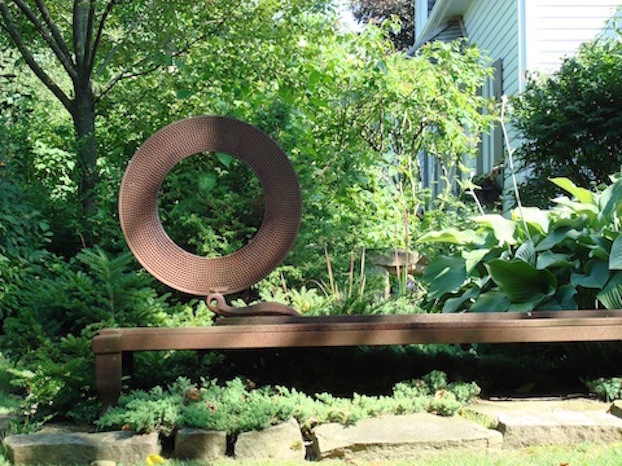 a found object, birdbath, or a funky piece of scrap iron, a brightly painted chair with a pot of flowers in the seat. See how your eye goes to the blue pillar through the arch? 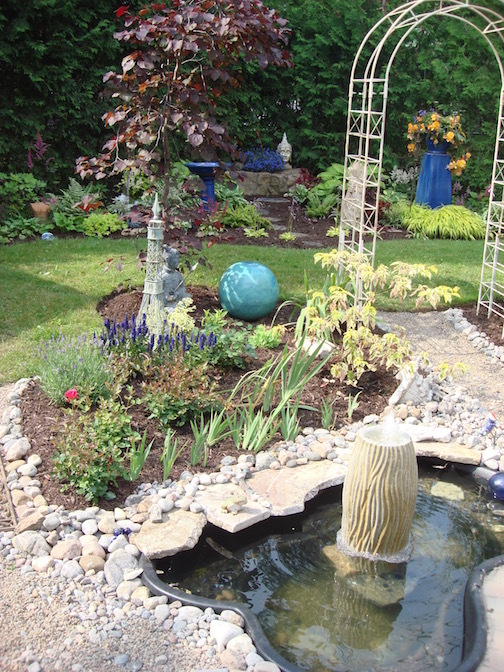 Even though the pond is in the foreground, the blue and orange contrast with the dark green hedge, and the lime grass is echoed by the dogwood. All these are either found objects, purchased off-season at huge discount prices or have been re-purposed - which is the most fun of all. 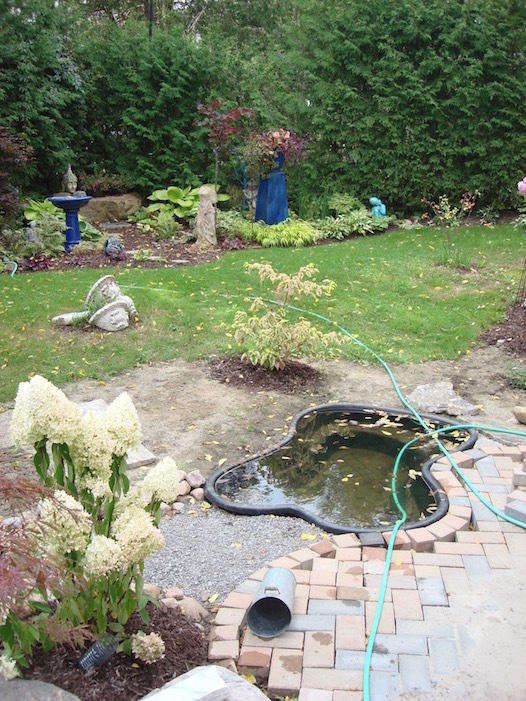 The pond, unused in a friend's barn; the arbour from a wedding planner; the fountain from the back-40 of a landscape company's trash heap and the pieces of marble are cast-offs from a counter-top company. 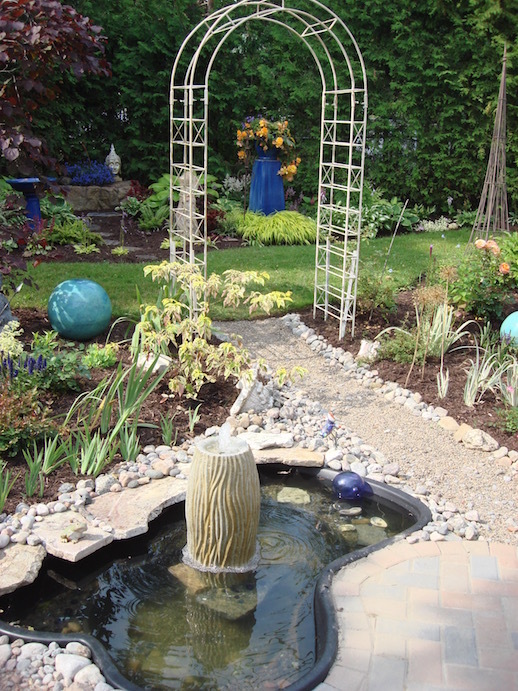 Water deeply so your garden doesn’t dry out and your plants don’t have to work too hard. Then note what worked and what didn’t. You’ll need to know this the following season and won’t regret spending time now. When you have completed these steps, go over the list again and start over… do these steps as many times as you need so your garden looks its best with what you have, what you can afford and functions the way you want. 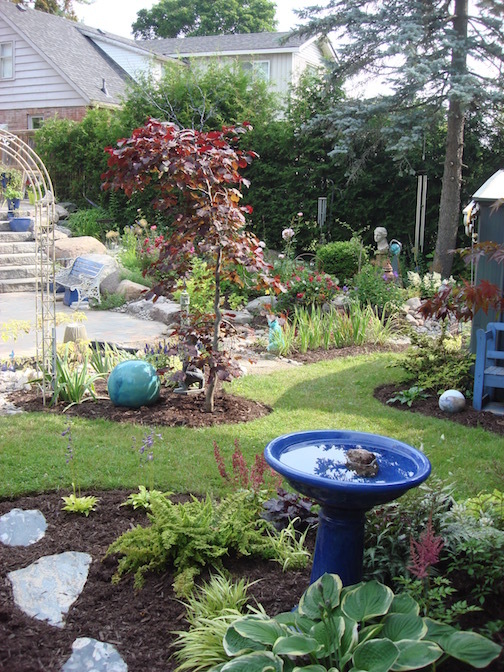 Although we all want a picture perfect garden, there is no pleasure in spending money and time you do not have. Do what you can, with what you have; use found objects, go to yard sales and plant sales and have more fun. But most of all, enjoy your garden every day. Walk in it, sit and think in it. Most of all, remember to leave space for the birds and the wind to plant what they like in your garden.